HK artist Freakroom is releasing the Crystal Frog edition of The Mythrilhorn of Ocean (海瞳) via lottery. Limited to 21 pieces, Crystal Frog features clear soft vinyl with translucent green beads lending the beast a bit of amphibian DNA. Crystal Frog is the second edition of the deep sea monster—seemingly inspired by the freaky real-life Angler Fish—and follows the original Aquarium Blue edition which debuted at Toy Soul in mid-December. 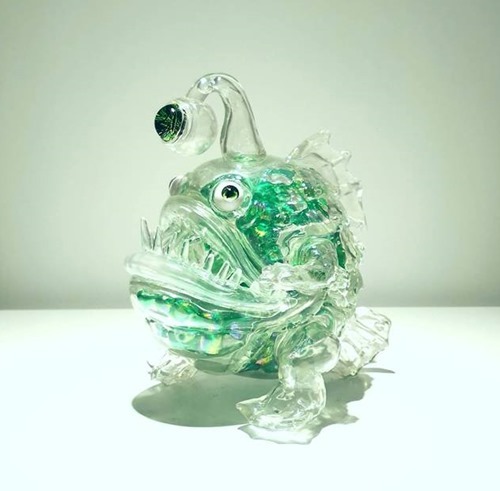 The Crystal Frog Mythrilhorn of Ocean (7") is available via lottery for $150 ($20 shipping) through 5 AM PST on Saturday (1.19). To enter you'll need to follow the artist, repost on IG, and send an email with specific contact info. Check out the full details on the official lottery IG post for all the details.